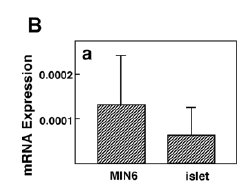 Comparison of the Expression of T1Rs and Gustducin in Islets and MIN6 cells. mRNA levels for T1R2, T1R3 and Gagust were measured by quantitative PCR in islets and MIN6 cells and expressed as relative to beta actin. The manifestation of the effects of a gene by the production of the particular protein, polypeptide, or type of RNA whose synthesis it controls. Nakagawa et al. 2009a. Sweet taste receptor expressed in pancreatic b-cells activates the calcium and cyclic AMP signaling systems and stimulates insulin secretion. PLoS ONE 4, e5106. Bartelt et al. 2011a. Brown adipose tissue activity controls triglyceride clearance. Nat Med 2, 200-206. Livak and Schmittgen 2001a. Analysis of relative gene expression data using real-time quantitative PCR and the 2-ddct method. Methods 25, 402-408. Schmittgen and Livak 2008a. Analyzing real-time PCR data by the comparative CT method. Nat Protoc 3, 1101-1108. タカラバイオ, リアルタイム PCR 実践編 - プライマー設計ガイドライン.Link: Last access 2018/06/25. Qiagen: How do I determine the amplification efficiency of my qPCR assay? Link: Last access 2018/07/03. Nakagawa et al. (2009a) is an open-access article distributed under the terms of the Creative Commons Attribution License, which permits unrestricted use, distribution, and reproduction in any medium, provided the original author and source are credited. Also see 学術雑誌の著作権に対する姿勢.